Three years in the making, Turning the Tide II: How Parents and High Schools Can Cultivate Ethical Character and Reduce Distress in The College Admissions Process, a report published by the Making Caring Common project at the Harvard Graduate School of Education offers guidelines for high schools and parents in promoting ethical character. The first Turning the Tide report, published in 2016, sought changes in admissions at the college level to advance three related goals: elevating ethical character, especially concern for others and the common good; increasing access and equity for economically disadvantaged students; and reducing excessive, damaging achievement pressure in many communities. The number of admissions deans endorsing Turning the Tide has grown from 50 to nearly 200 over the past three years. This follow-up report shifts the focus to the role of families and high schools in college admissions. It also describes how some high schools and colleges are working to promote greater ethical engagement among high school students, level the playing field for economically disadvantaged students, and reduce excessive achievement pressure. 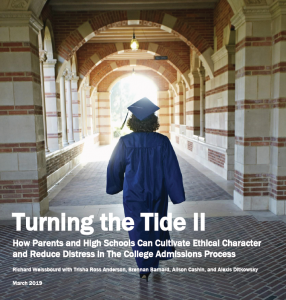 Turning the Tide II makes the case that an intense focus on academic achievement has squeezed out serious attention to ethical character in many high schools and families, especially in middle- and upper-income communities. With a narrow focus on high achievement and admission to selective colleges, parents in these communities often fail to help their teens develop the critical cognitive, social, and ethical capacities that are at the heart of both doing good and doing well in college and beyond. Read more in the Executive Summary (PDF) or the full report (PDF). Read more in the Executive Summary (PDF) or in Resources for Parents. Read more in the Executive Summary (PDF) or in Resources for Educators. Excerpted from “Turning the Tide II: How Parents and High Schools Can Cultivate Ethical Character and Reduce Distress in The College Admissions Process” on the Making Caring Common Project website. Read the full article online. Making Caring Common, a project of the Harvard Graduate School of Education, helps families, educators, and communities raise kids who care about others and the common good. Learn more at www.makingcaringcommon.org.